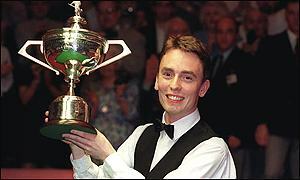 beating Stephen Hendry 18-12 in the final. runner-up for the second year in a row. 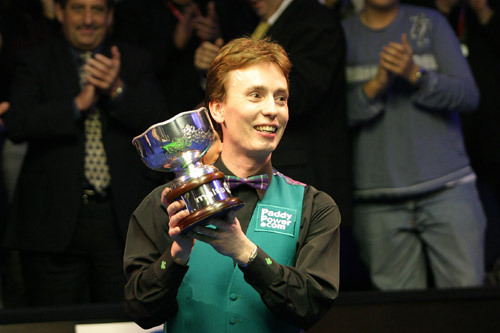 player that you found he has the potential to become a snooker champion? Kelly: Do you think your project can help the development? conditions that also offers coaching can only encourage new talent to emerge. than me, the biscuit tin went missing! you like playing poker, do you play it with other players? the new season start. What did you do in these two months? and make it up when I am back. month, partner with Fergal O'Brien. It must be great to play for your home country! Do you guys practice together to prepare for the doubles? It’s been a while to play doubles, isn’t it? presentation. Any more chance to be a presenter in the future? player or commentator, or both? How’s it feel in the commentary box? all the other pundits, it doesn't feel like work at all. about the new ranking systems and the new overseas tournaments? Kelly: Did you enter the coming PTC events? Are you excited with the new season? year round. We really feel like full time professionals now. atmosphere you enjoy playing in? Crucible for tension and drama and excitement. Kelly: What`s your favourite animal? Do you keep any pets at your home? Ken: Siberian Tiger. We have two King Charles Spaniels,Toffee n Fudge. Kelly: Your favourite country in the world? Kelly: Do you have any inspiration quotations? Kelly: The craziest thing you have done?